Leading Indian tyre manufacturer CEAT Limited marked another milestone with the launch of rally tyres for Scooters, 90/100-10 Pro Gripp, at Raid de Himalaya 2015. 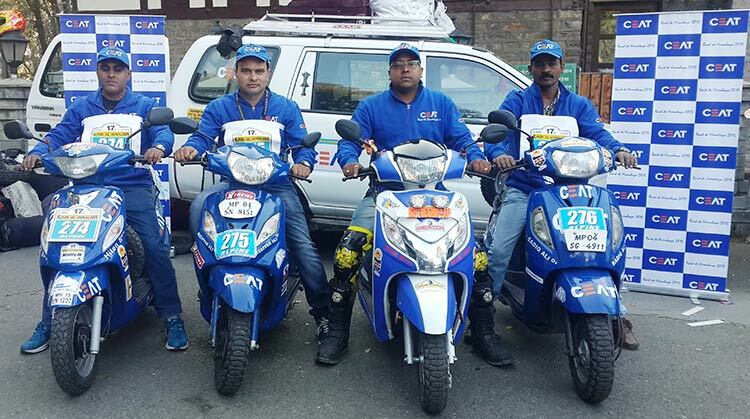 90/100-10 Pro Gripp secured team CEAT several miles in the Moto Alpine Category of the World’s highest rally. The new range of tyres is targeted towards the ever-growing community of 2w rally professionals and enthusiasts in India and the World. Designed specifically for rallies, Pro-Gripp has a wider block tread pattern with superior grip and stability for off-road condition. This progressive make comprises of hard tread compound used to improve cut and puncture resistance in off roading, while the open tread grooves allow easy slush removal. 90/100-10 Pro Gripp has an excellent fitment for a wide range of scooters such as Activa, Dio, Maestro, Pleasure, Access, Swish, Vespa, Alpha, Fascino, Ray. Engaging with riders at Raid De Himalaya, CEAT participated in the scooter category wherein cross country riders have to cover an approximate distance of 1850 km travelling through some of the most picturesque locations in Manali, Dalhousie and Rangdum. Raid de Himalaya 2015 hit the high-note as riders battled newer and extra strenuous routes through altitudes of above 15,000 feet, exposing them to the harshest of climates. Riders had to complete the stages of the rally route through hilly terrains, muddy roads, gravel, stone, peaks, slush, hard rocky terrain and sand.